Beach rules prohibit alcohol and glass containers. The sand dunes are protected under State and Federal statute. We request that you respect this natural area. Driving, overnight camping and open fires are prohibited along the beach strand within the corporate city limits. All personal items and beach equipment that are left unattended and remain on the public beach between sunset and sunrise will be classified as abandoned property. Items will be removed and disposed of by the Town. Not removing beach equipment between sunset and sunrise could result in a $40 fine per day. Emergency lane of no less than 10 feet should be left open along the dune line. 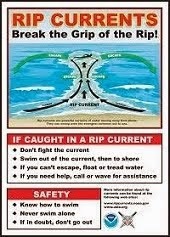 Rip current signs (see sign here) have been placed at popular public beach accesses and at the public bathrooms/showers. Please make yourself and your families familiar with these signs. They could save your life. 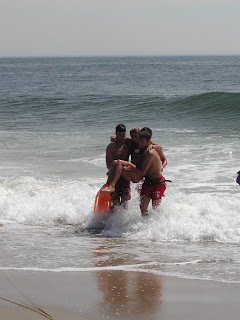 Always swim near a lifeguard.